Bill Gittins, former SR West Rotarian, will speak about ARTrails and the Art Council of Sonoma County. “As a painter of land, water and sky, I began painting in the mid-1980’s, attending classes and workshops conducted by regional and national artists whose work I appreciated. Images of the work of my favorite artist, Edgar Payne, the mid-19th century plein air painter of California, are always in mind as I pick up a brush. The many strokes laid down over the past 25 plus years, completed in both plein air and in my studio, have helped me garner the success and respect I have achieved to date. My paintings hang regionally, nationally, and internationally; in private and business collections. I paint what feels emotionally good to me…finding my way; my path. You will often find simple trials or roads in my landscapes…leading somewhere…just as what happens in life. To where does that path lead? What lies around that bend? Which path should we take? Observation, experimentation, and my interest in “what is around the corner” or “just down the road” for each of us in life are keys to how I approach each painting and serve as my inspiration and guide. As a Certified California Naturalist, I am a lover of land, water and the sky. I am drawn to the shapes and radiance of them all. Physically, I want to feel them; emotionally I must experience them. My mind’s eye must paint them. 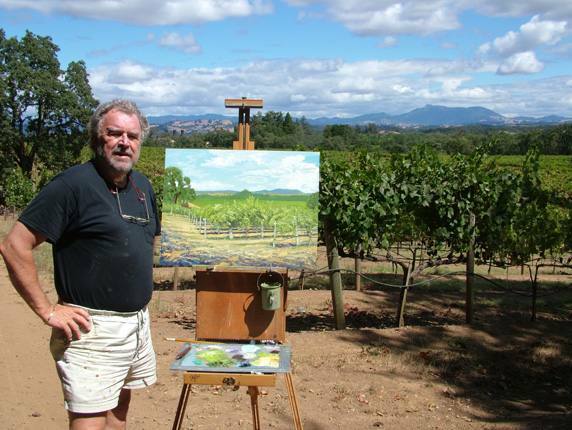 Born in Whittier, California in 1946, Bill has lived in, and has enjoyed, Sonoma County since 1973.